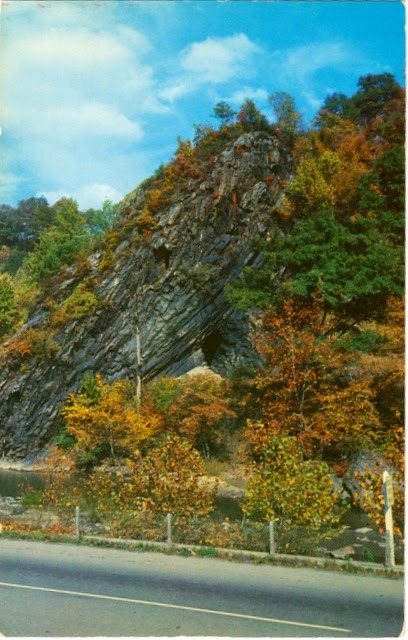 Outgoing postcard US-3125851 to Czech Republic shows the Bee Rock Tunnel, a former railroad tunnel located Appalachia and Big Stone Gap, Virginia. It was built in 1891 by the Louisville and Nashville Railroad. At 47 feet 7 inches or 14.50 meters, It was once known as the World's shortest railroad tunnel. However, it was soon realized that both the Westmoreland Tunnel (46 feet or 14.02 meters) in Gallatin, Tennessee and the Backbone Rock Tunnel (22 feet or 6.70 meters) near Crandull, Tennessee were shorter than the Bee Rock Tunnel. The Bee Rock Tunnel is now part of the Bee Tunnel-Roaring Branch Trail.